The Southwestern US is a world away from my cozy mountain homeland. The land is barren and the sky large and bright blue. Rugged mountains capped with snow and covered with sage are the opposite of the thick, hot-house feel of my rambling hills. But I love everything about this foreign world: smell, dry air, vast sky and desert. It isn’t home, but it feeds my soul in the deep simplicity of the landscape. 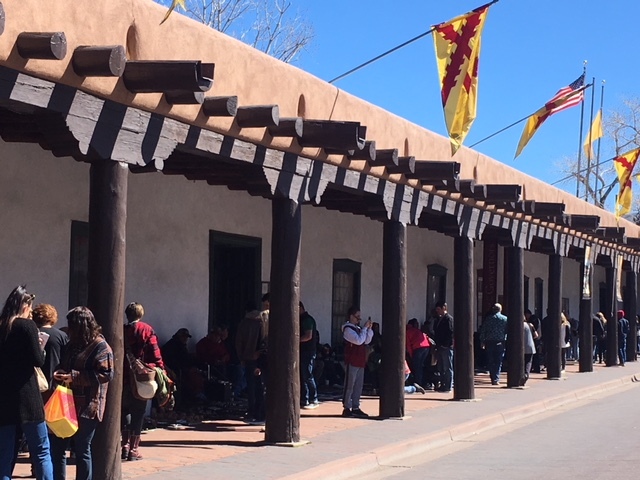 A dear friend went to New Mexico last year and became so in love with this Land of Enchantment that she organized a trip for her daughter and close friends to come experience the magic. We flew into Albuquerque and then drove the hour or so to Santa Fe. 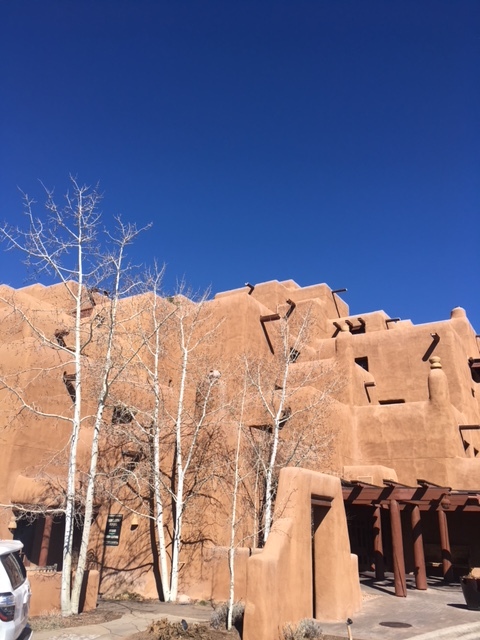 We stayed in the Inn and Spa at Loretto, a beautiful adobe building that resembled a pueblo. My room looked out on the famed Loretto chapel, the first gothic building west of the Mississippi. Our little group of four were tired and hungry after our early morning flight so we wandered to the historic town square and found a place to eat and rest while adjusting to the altitude of 7200 feet. After our late lunch, we wandered the square looking at the wares laid out on the blankets under the portico of the 400-year-old Palace of the Governors. Beautiful jewelry, pottery and art made by local artisans felt like I was enjoying a living, open-air museum where I could actually touch the art. I purchase earrings with Kokopelli stamped in the silver and a copper necklace for my mother. The altitude and time change meant we were ready for an early night, so drinks and appetizers by a warm fire was the perfect ending to our first enchanted day. After breakfast in a little French café, the first stop was the mysterious Loretto Chapel that was built in 1878 by the Sisters of Loretto. This small chapel has a “miraculous” staircase to the choir loft. 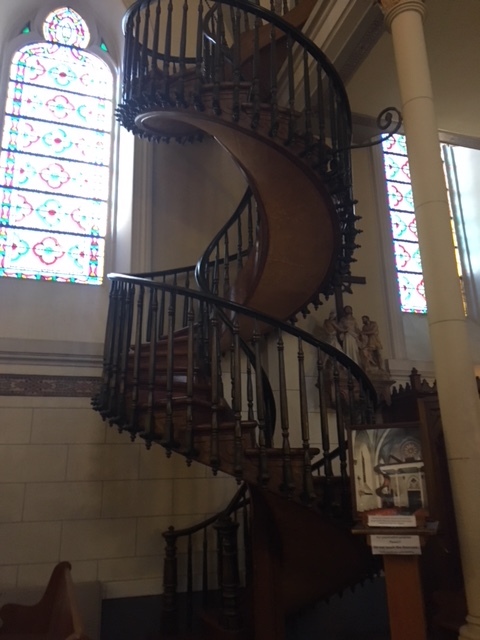 The story is told that the chapel was too small for a conventional staircase and the predicament was solved by a mysterious stranger that came and built a spiral staircase without any central support or handrail. He then disappeared, never to be seen again. A masterful work of carpentry, the stairs seem to defy the laws of physics, a miracle of skill and artistry. 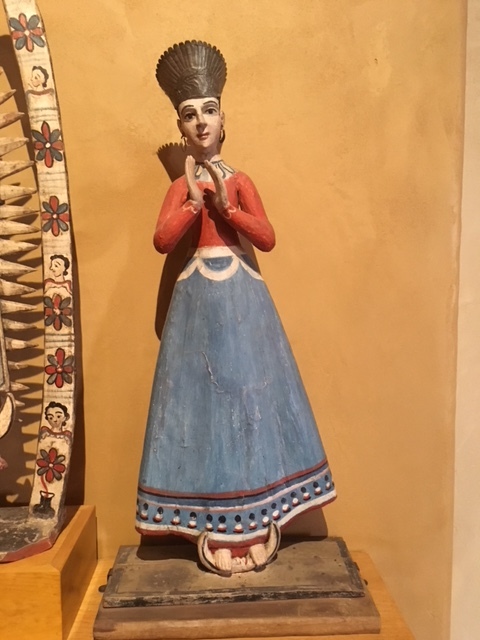 There are many beautiful museums in Santa Fe celebrating the art of the local people and history of the land and people. Recently a new interactive museum, Meow Wolf, brings together young artist to make a fanciful world of light and sound to explore. It was hard to choose but I wanted to see the Georgia O’Keeffe museum just off the center square. 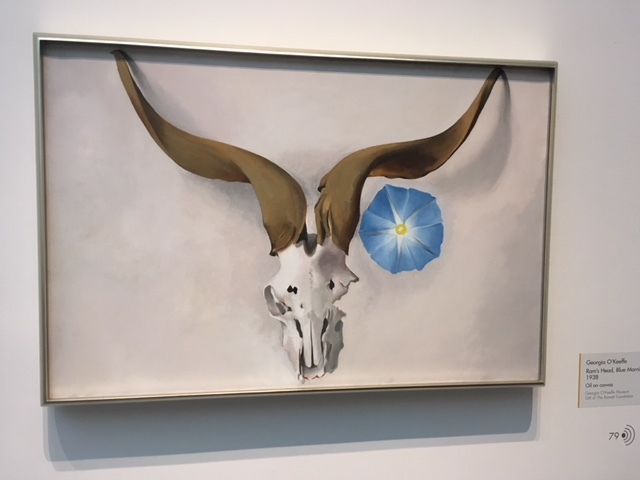 This remarkable and celebrated painter made Santa Fe her home for the second half of her long and productive painting career. I was interested in who Georgia was as a creative woman and a new film of her reflecting on her life gave me great encouragement to find my own creative second act. 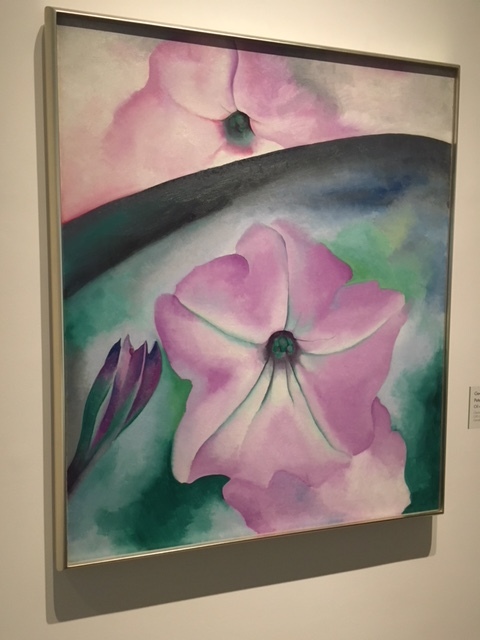 Her work is both stark and lush, bold and delicate and absolutely a reflection of her innovative life. Wandering around a town that is so dedicated to art and beauty became an enchanted experience. The trees were still ghost silhouettes against the deep blue sky which contrasted with the earth colored buildings. It is truly an original American city that deserves its place as one of the most beautiful in the country. After lunch, I visited the St. Francis Basilica and the Palace of the Governors. I wandered around these old building on my own just admiring what caught my eye. I was drawn to the icons and statues of the local saints. Each had a primitive beauty and a story to tell. I particularly loved Our Lady of Immaculate Conception standing on the crescent moon. I finished my day with some quiet reflection (nap) while my fellow travelers had spa treatments. 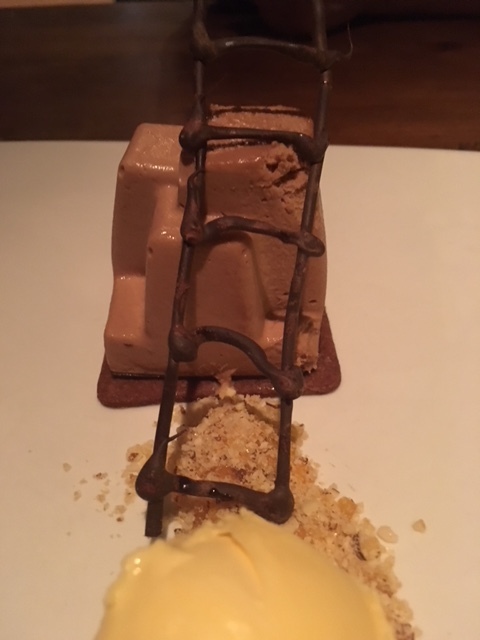 A delightful dinner followed with the star of the show a chocolate mousse in the shape of a pueblo with a little chocolate ladder to access the top story—totally adorable. Santa Fe is a living dream, stark and lush, beautiful and barren, a feast for all the senses. I can see why it inspires such deep creativity in the people and sparked new creative spirit in my heart. My friend Melynie is an expert tour guide and had a full agenda of amazing sites. Her home is near Puli, Taiwan, the geographic center of the island. First we went to the top of the 2nd tallest mountain, Hehuanshan, over 12,000 ft. The view going up was lovely but the top was in cloud providing pelting, freezing rain so we quickly descended to a lower elevation for a lovely picnic. One day we went to see reproduction aboriginal villages of Formosa, the original name of Taiwan. At this park was also a mini amusement park with an imitation Space Mountain ride and a short cruise through Jurassic World. It was almost spring so we got a hint of flowering trees. The grounds were beautiful and would have been lovely from our gondola ride if we weren’t in yet another cloud. Highest building, tallest mountain and beautiful lake all had the same view on my trip—-pure white. Fortunately there were less cloudy days and the tall, sharp mountains with mist and pagodas made a picture-perfect scene straight out of a Chinese painting—yes it really looks like that. I shopped for tea sets and jade and ate at McDonald’s. I also tried Hot Pot. The vegetables and tofu were lovely boiling in broth, as long as I didn’t add duck intestines or pork belly. We ate at noodle shops with the kitchen on the street and tables behind. 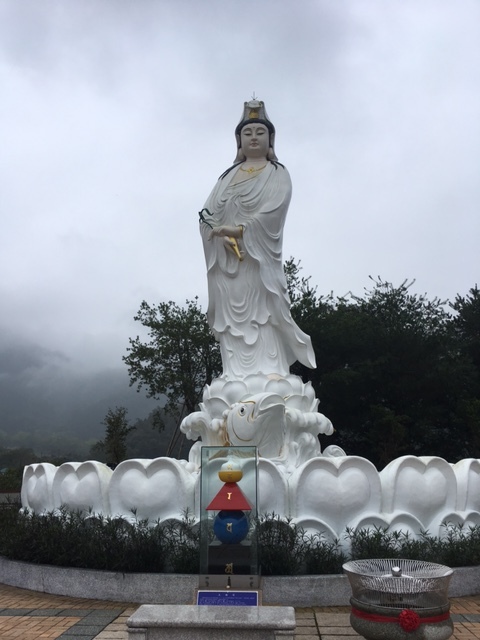 We visited a giant Kwan Yin statue presiding over a lake and feed every koi we could find. Just as we would run out of fish food I would dump the last in and start a fish riot—those things are noisy when feeding. But the highlight of the visit was—you guessed it– temples and they are world class. The Mount Great Buddha took my breath away. High on a hill sits the world’s largest outdoor bronze and gold Buddha- 558 feet tall. It is a place of pilgrimage and a sign gave instructions for the traditional ritual for blessings. Make a half bow, with your hands clasped. Circle the statue clockwise three time while reciting the name “Amituofo”. Make another half bow and then a prostration. Inside on the main floor are three 12-ft. tall Buddhas under a painted dome and 88 gold Buddhas, one for each sutra. 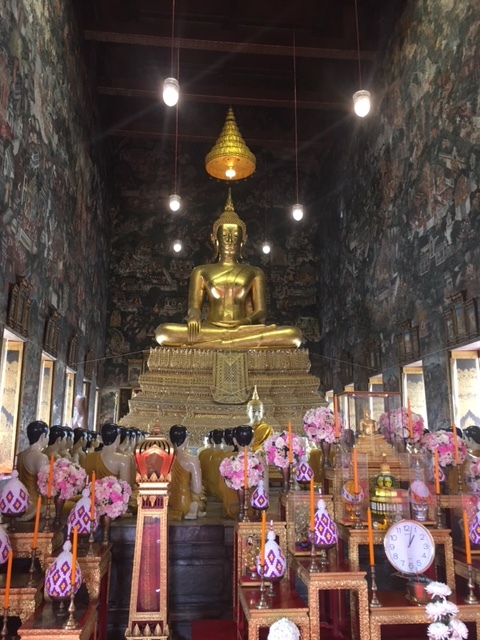 On the upper floors are thousands of gold Buddhas along the wall with lights on the floor that looked like galaxies. It felt like I was walking in another dimension. This amazing temple, finished in 2011, is Western Pure Land on earth. Words fail me trying to convey this truly spectacular holy site. It is powerful and yet approachable. We were the only ones there that day and I felt like I had my special moment with this breathtaking Buddha. Across the valley was our next temple, the Chung Tai Chan Monastery. Finished in 2001, this monastery was build for spiritual cultivation and refuge. This award-winning building embodies the Dharma with art, culture, science and the teachings of the Buddha. Four 40 ft tall temple guardians, the tallest in the world, greeted me letting me know that this is a holy place that I was to approach with reverence. Up the stairs is the red granite “transformation Buddha” also know as “the Great Majestic One”. 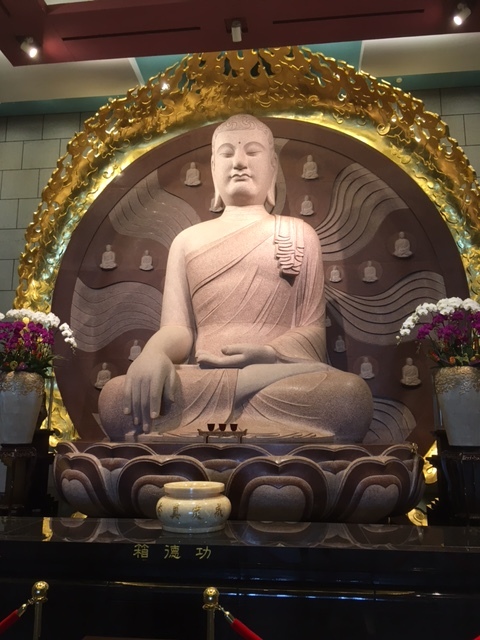 Silence is required before this holy Buddha as he reflects his compassion in the world of suffering. We joined a Chinese language tour so that we could see the rest of the building. 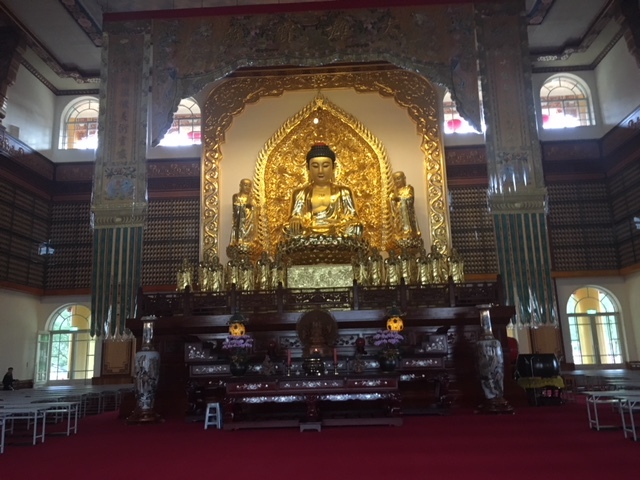 On other floors were sparkling white Buddhas, a seven-story teak pagoda with the Medicine Buddha, two stairways for pilgrimage and meditation halls. Everywhere I looked were thousands of Buddha images. 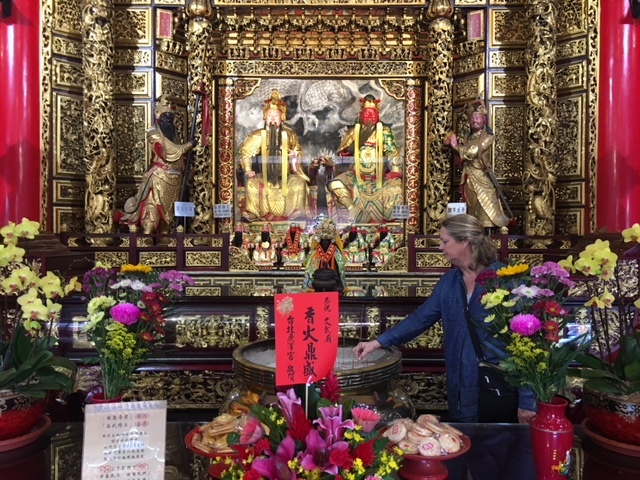 Although both of these temples are new, the power of the devotion to the Buddha gives them a serenity of deep sacredness. There was one last temple that day. I don’t know the name as there were no signs in English. 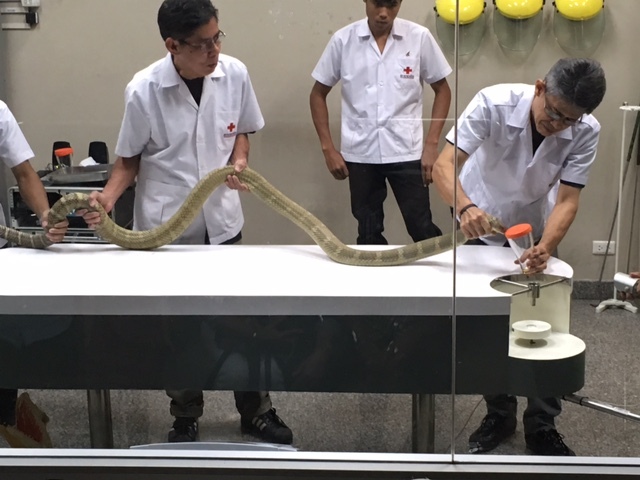 It was being prepared for the Chinese New Year and a conference. The smell of flowers and incense permeated this holy place all made even more beautiful with the sounds of the monks chanting their prayers. Each temple that day was a perfect and unique experience. Any one would have been more than I could have hoped for. But, the three together made an unforgettable experience in the heartland of this beautiful country. The final day in central Taiwan was the blue blood eclipse moon on January 31. 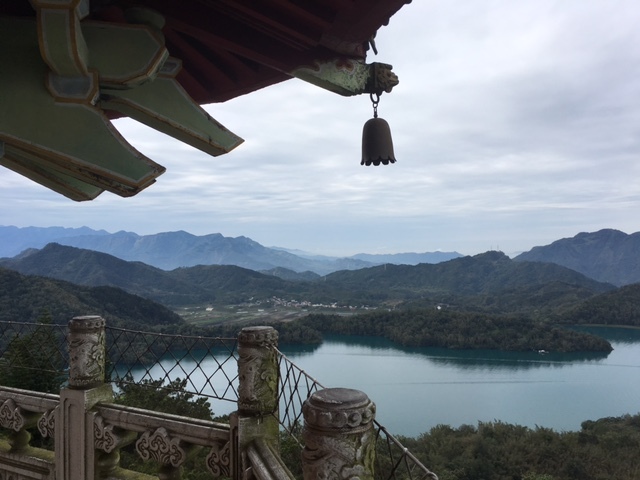 Unfortunately pesky cloud cover kept me from seeing the eclipse so I thought it was a good day to go to Sun Moon Lake. First we climbed 580 steps to the pagoda overlooking the lake and then took a boat ride on the lake. 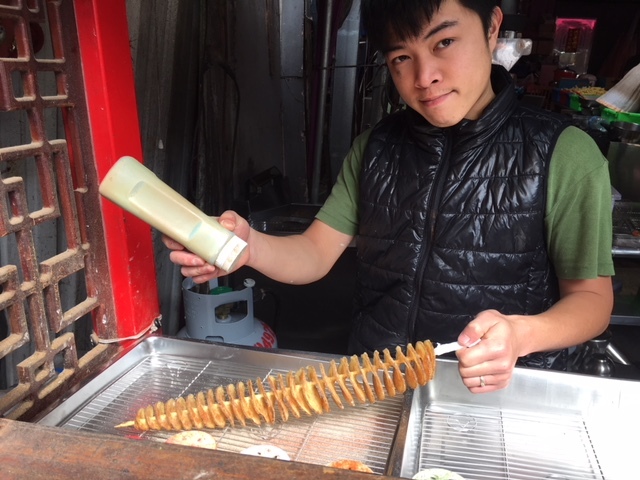 Street food was the perfect lunch, tofu stuffed with vegetables and spiralized deep-fried potato plus bubble milk tea. I live for bubble (boba) tea. 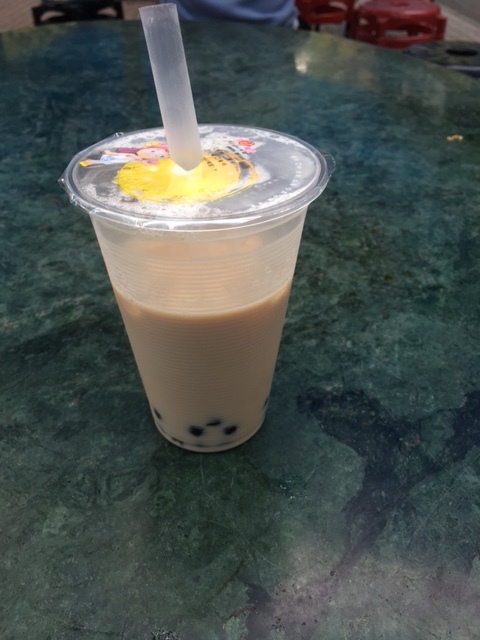 This Taiwanese creation consists of milky tea with ice and large tapioca balls that you drink with a big straw making it a chewy, sweet treat. This original tea is the best I’ve ever had and I’m a connoisseur. I’m now trying to reproduce it at home so next time you come for a visit we will have iced bubble tea on the porch—a new Southern tradition. Of course there were more temples. 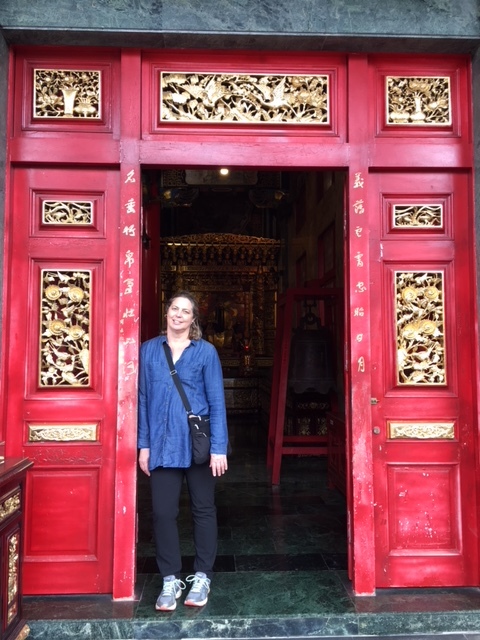 At Xuan Zang Temple the nuns were chanting as we walked around and viewed a relic from the 7th century. Next was a Toaist temple, Wen Wu, much more elaborate than the Buddhist temples. Every inch is red or gold, carved and beautiful. There are many levels, each one increasingly lovely. Both of these temples where modern but I liked that they are living temples and not relegated to just history. The last day in Taiwan Melynie and I went back to Taipei so I could catch my flight the next morning. 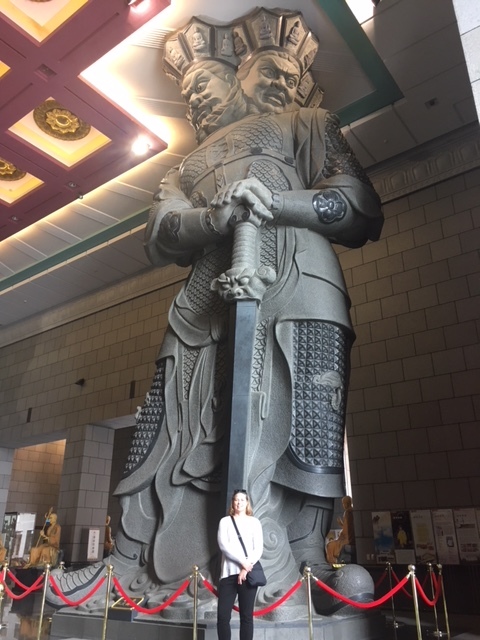 We spent the day at the National Palace Museum. Melynie had not been there yet and it was fun to explore together. Chang Kai-shek, the founder of modern Taiwan, saw the cultural revolution coming in China and packed up all the art collected for hundreds of years by the emperors and shipped it to Taiwan. The best of over 700,000 treasures are on display, spanning thousands of years of history. 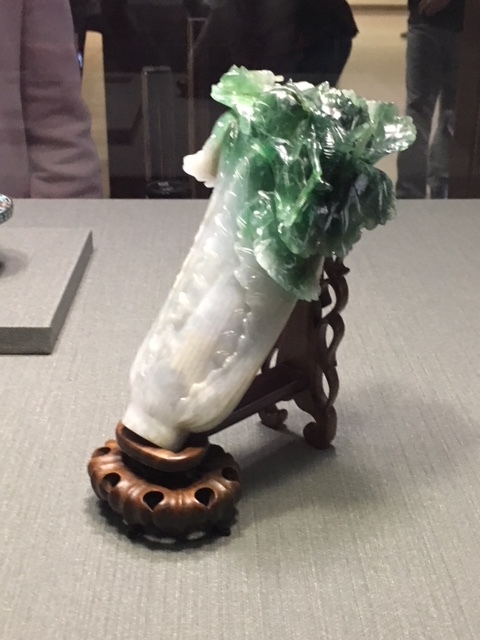 The most popular object in the museum is a Bok Choy carved from jadite—a unique choice but fun. You can buy a replica of this cabbage in every imaginable form. A walk in the formal gardens and it was time for supper. We ate in the mall deep in the central station. Melynie was so happy to have American food and find a book store with English books. She felt like she had a mini-vacation and a taste of home. It was hard to part the next day. Everyday was fun and enchanting with sacred sites, beautiful scenery and lots of bubble milk tea. It was the loveliest adventure with the dearest of friends. 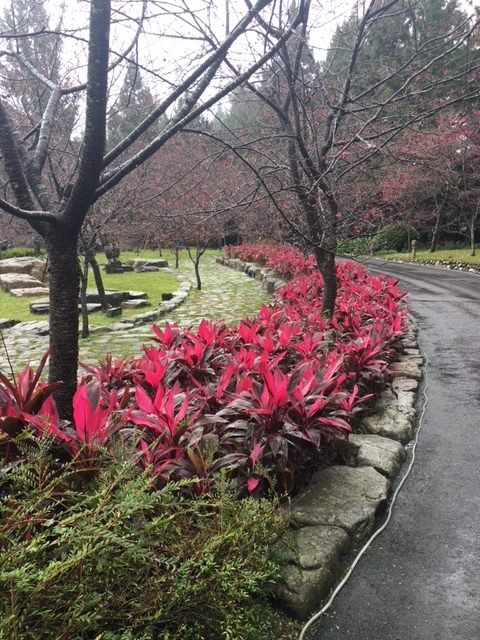 Nothing shows the journey of life better than a garden with its seasonal cycles of blooming and rebirth. For children who are victims of physical and sexual abuse and trauma the healing/therapy garden at New Hope is a welcome retreat as a place of healing and renewal. The New Hope Therapy Garden is a private outdoor garden space that has been specifically designed to meet the physical, psychological, social and emotional needs of the children using New Hope and its resources as well as their caregivers, family members, friends, and staff as a place to re-connect with their well being and heal the invisible wounds of current and post-traumatic stress. The design is to inspire play through nature exploration, nature and gardening care, and imagination. Throughout the whole garden we engage the child through various textures, sounds, imagination and interaction. It instills awe and wonder, and invites anyone to come in, look, listen, and see what grabs your curiosity. We enter the garden via the numbered circled path. There are two ways to use the path. The first is by hopping as in playing hopscotch. The next way of using the path is to sing. Each colored marker on the path makes us stop and sing a first line of a song such as Twinkle Twinkle Little Star. Both hopping and singing are ways to enter the present moment, the here and now. We have to concentrate really hard to hop on one foot and then the other. It’s a relief to be able to stop with both feet on two numbers. It doesn’t leave a lot of room for outside thoughts to run inside our minds. Singing also achieves the same thing. We can only sing one note at a time. It takes full concentration and our full breath. We need to sing the correct pitch, have enough air in our lungs and move to the next note in the song as well as sing the correct words. The pathway is an indicator that we are transitioning from the world out there, that at times isn’t so nice, to the safety of the garden where we will explore, experience, and embrace nature through play. Everything that happens in the garden, happens only in the present moment, the now. The experience of the garden opens up new possibilities and new ways of seeing things. Just in front of the parking lot are four moveable garden planters. These have been planted with a variety of flowers which once cut come back again. Such flowers are zinnias, calendula, marigolds, nasturtiums etc., as well as, herbs. All of the flowers and herbs in the planters will be used for nature play in the Nature House and in the Fairy Forest. The flower planters are also away for the children to take the watering cans, and trowels and personally help care for the garden by watering and weeding. Both child and therapist while weeding, watering, or picking flowers can have those very important conversations that foster healing. Each Spring a 6 x 9 house will be created completely out of several sunflower varieties. Children love hideaways to play in and view the outside world without being seen. The sunflower house is such a place to sit and create flower and nature mandalas, rake a zen garden, or sit an enjoy the world around them as birds fly in and out and squirrels scamper up and down the trees. It’s a place to feel protected, ponder and create. Using only natural materials such as sticks, shells, stones, leaves, pinecones, acorns etc, we create fairy houses. There is no right or wrong way, only natural materials can be used. No nails, glues, twine or string. Building a natural fairy houses instills the idea of being able to fix things that one doesn’t like. We can create something enchanting by using our imaginations and by creating with what nature gives us. The Fairy Forest instills the idea of impermanence that something may not be there forever but we can rebuild with what is left over and what new things we can pick up from around the fairy forest to build with. Therapists also share the idea that they can create a safe house in the Fairy Forest and build what that looks like. House by house, the forest fills until one day we come upon an entire village. There are two old trees in the garden and the stretch of land between the left hand tree, the bird bath/water play area and the tree on the right hand side will encompass the Fairy Forest. Sitting in a field of seasonal flowers is our water play area. Local artist Linda Edmunds created bird baths using large squash and rhubarb leaves. Each one is hand painted and sealed to bring a fun and playful feel to the garden. The bird baths instill water play. Just to the right of the field of flowers is a big concrete bowl which when filled will have floating balls in it. Both the bird baths and bowl invite the child to play by simply pouring water into them as well as placing various nature items there to interact with. Many specific therapy modalities also use water as a tool for healing. This allows free play and imagination in a structured setting. Welcome to the meandering path. Labyrinths are used as a centering tool to quiet the mind. The labyrinth at New Hope is a 7 circuit Chartre labyrinth. The path winds its way back and forth, in and out. The mind becomes disoriented because it’s not sure which way the path will turn next. This confusion actually calms the mind in a still and gentle way. The wandering path also in only the width of one foot which means you can only walk with one foot, one pace at a time. Another tool which silences the mind. A labyrinth isn’t a maze. The same path we use to walk to the center of the labyrinth is the same one we use to walk out. A labyrinth is a tool of transformation. We are never the same person who walked into the labyrinth as the person who walks out. There are three stages of a labyrinth walk. The first is the intention to walk the labyrinth, quiet the mind and leave the outside world behind. The second is the actual walk. As we get closer to the center we are moving into our own interior space. Once in the center we take a moment to reflect, whether that’s a simple moment of gratitude, to take a few deep breaths or to even meditate. We are in the center of ourselves as well as being in the center of the labyrinth. Those few moments we took in our walk and reflective thoughts have us walking out a more centered person than when we walked in. The very design of the labyrinth instills this whether we choose to reflect in the center or not. The labyrinth was designed for little legs and so the adults who walk it comment that the turns happen quickly, yes for long legged people but for our children visitors it’s just the right of walking paces between turns. Since the labyrinth has been installed, both staff and children have enjoyed walking the wandering path. Next to the labyrinth is our Nature House. It is a place to have important conversations while playing and creating with nature. While in the nature house, children can create nature mandalas, use therapy trays such as sand, stone, and landscape as well as rake into the table top zen gardens. Nature House is also a great place to be outside in all kinds of weather. It offers some protection from rain, snow, and sleet, allowing children to experience all moments regardless of weather outside. As the children connect with the garden they are planting seeds for the future. The garden, the connection to nature, and life after the stress of abuse, are full of hope. New Hope is a private garden and safe haven for those that utilize New Hope and its facilities and is closed to the general public. The therapy garden was designed by Maryville resident Valarie Budayr. Valarie has been gardening her whole life. Valarie was on the creative design team for the Secret Garden at the Knoxville Botanical Gardens which opened in October of 2016. Valarie’s area of garden design specialties are labyrinth building and design as well as secret gardens, fairy gardens and houses,paradise, and healing gardens. She also greatly loves her vegetable garden. Valarie is also known as an award winning author and publisher. It was her great joy to create the Therapy Garden at New Hope and wishes much healing and creative nature play to take place there. A couple of weeks after my trip to Southeast Asia I found myself yet again in a very different world and a very different experience. Alexandra wanted to meet up on NYC for a mother/daughter arts weekend—how could I say no to that. My sweet girl and art—never a better combination. For both of us it was a pilgrimage for we were going to see the New York City Ballet perform The Sleeping Beauty. I have loved ballet since I was a small girl but it wasn’t available to me because of religious restrictions. When I became a mother and removed those artificial restrictions I put my daughters in ballet class the moment they were old enough. I was too old to begin ballet but could live vicariously through them—-I’m so glad it worked out for all of us. Alexandra became passionate about ballet and it was her life all through school and beyond. She still takes class regularly and informs me that it is essential for her life and mental wellbeing. She is six feet tall and professional dancing isn’t her career path but instead she just gets to find the joy with none of the pressure. 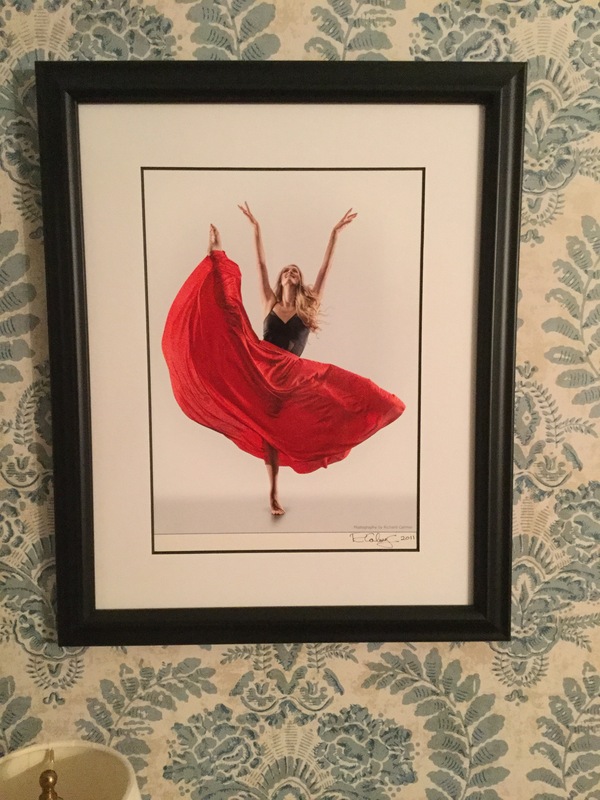 Over the last few years she has become passionate about the New York City Ballet and follows them like others follow football. She knows the players, the moves, the opponents, the dramas and the choreography. So in February NYCB was performing her number one ballet The Sleeping Beauty. This ballet contains the quintessential elements of ballet in its highest form. The music, costumes, story, dancers, orchestra and audience all come together to experience art at its most refined and inspired. Tchaikovsky wrote the music to The Sleeping Beauty in 1889 and was first performed in 1890. It has been a touchstone for classical ballet ever since. Along with The Nutcracker and Swan Lake, The Sleeping Beauty will forever remain a popular and perfect ballet as it is at once pure beauty and mythic story that touches our hearts. For in the classic fairytale we are reminded that true unconditional love awakens us from our unconscious lives. The NYCB production is choreographed by Peter Martins and is very much in the school of George Balanchine who founded the company. It is this perfect combination of the magnificent score by Tchaikovsky and the unique and truly American style of Balanchine that makes this work iconic and universal. Yet it was over 100 years in the making. Balanchine, a half a century after Tchaikovsky, pioneered a style and technique that matches the music like never before and elevated the art to a new level. It is a unique art form that can change and grow but yet still convey the essence of the original story and music. Ballet is art expressed with the human body in time and space and this is the essence of this pilgrimage but makes it so different from visiting sacred sites. This is a pilgrimage of Time and ephemeral beauty. It is Time that brings the music and movement together in a refined state. Only in Time does this experience exist, the music and movement are only in the Now, fleeting and yet eternal in the effect on all who participate; dancers, musicians and audience. Alexandra and I were enraptured by the experience and what human beings are able to create. Each perfect movement to the perfect note is a transcendent moment. 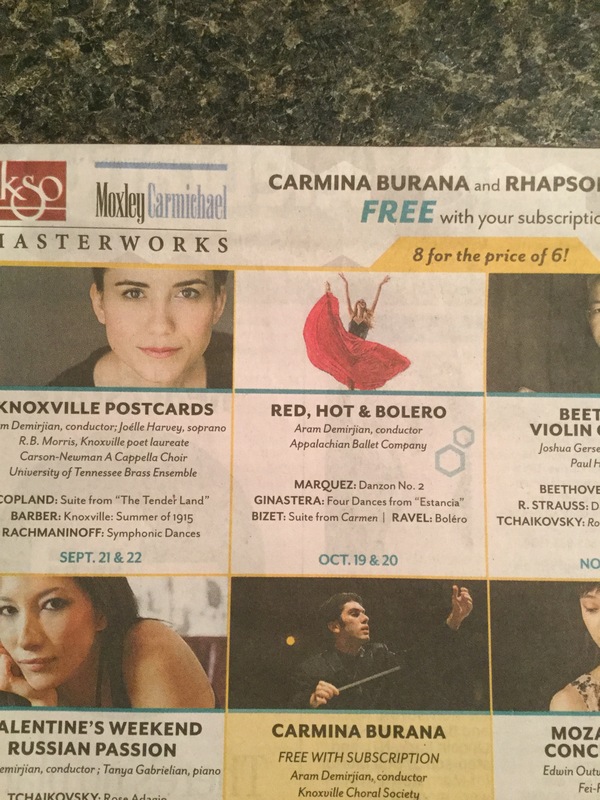 Alexandra is the poster child for October 2017 Knoxville Symphony. This picture from 2011 is just pure joy. 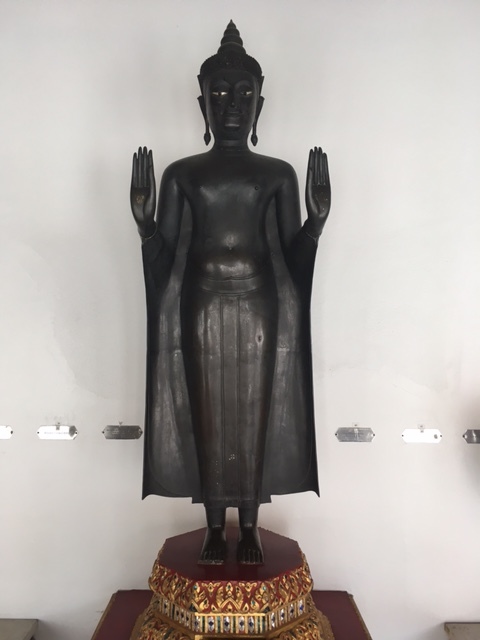 On our trip to Bangkok, Hamilton was in search of his past and I was in search of the Buddha. I live in a part of the country that is dominated by fundamentalist Christianity and there is little of Buddhism. The idea of being in a country where the Buddha is everywhere and in all things was so very thrilling to my heart. I was going to a land that honored the path of enlightenment, something most Americans haven’t even heard of. There are over 400 temples in Bangkok and I knew better than to want to see them all but I had a list of some of the most important ones that were accessible from the central part of Bangkok. 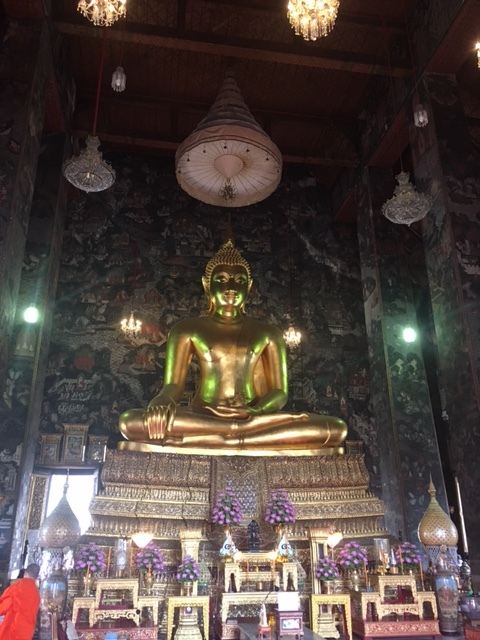 In the last post I talked about Wat Pho with the enormous reclining Buddha. 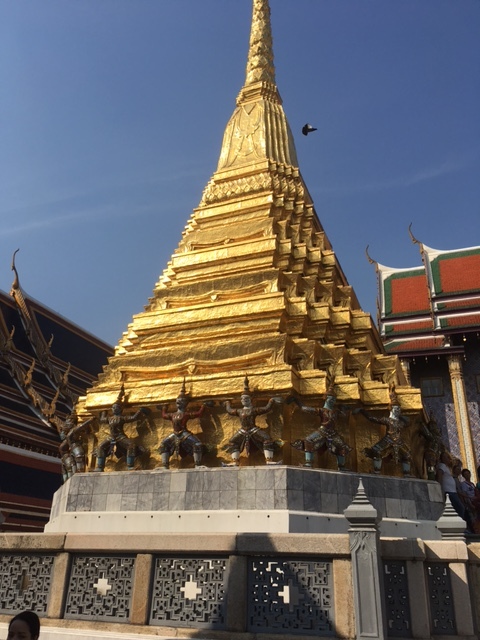 The next stop on our tour was the Grand Palace, home to the Emerald Buddha. The king of Thailand died last October after 70 year on the throne—history’s longest reigning monarch. Thailand is currently in a yearlong mourning and everywhere you go and on every street corner is a shrine to the king. The streets are lined with gray and black bunting. The Grand Palace is the ceremonial and administration center of Thailand but it is also holds the spiritual icon of the land, the Emerald Buddha. Everyday of this year of mourning up to 20,000 Thais, all dressed in formal black clothes, come to the Palace to pay their respects to the king. Many wear a rhinestone pin of the number 9 in Thai for Rama IX their deceased king. The palace grounds are extensive and there are many beautiful buildings and statues, some Thai but also some with the influence of western architecture. 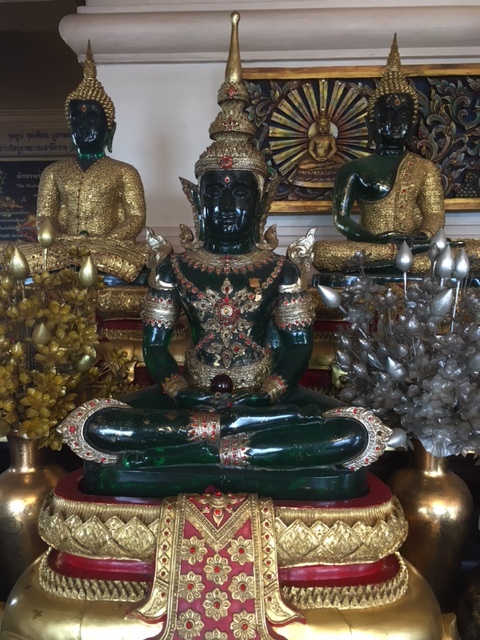 In the ubusot, the most holy building, built by Rama I in 1782, the Emerald Buddha sits high on a golden alter. It is 19 inch wide and 26 inches tall and made of jasper. Three times a year the king comes and changes the clothes on this Buddha depending on the season. This Buddha represents the heart and soul of the country. As in all Buddhist temples, I took off my shoes and quietly entered this holy place. Pictures are not allowed and there was a special place in front for the Thais to kneel; visitors had a different spot. It was crowded and the Buddha seemed distant and small on his golden throne. I just stood quietly and was grateful for the opportunity to be at this special place. 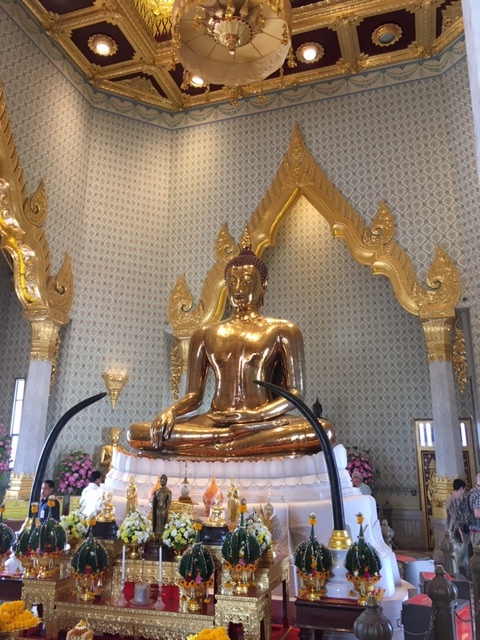 It was my turn to choose our next stops and of course I was in search of golden Buddhas and I wasn’t disappointed for on the edge of Chinatown is Wat Traimit and the ultimate golden Buddha, 5.5 tons of solid gold serenity. We climbed up several flights of steps to the top of the temple where this most valuable sacred object in the world resides. It wasn’t until 1955 that a large plaster Buddha was dropped while moving and a crack revealed the true nature of this Buddha. It had been hidden from thieves for centuries. 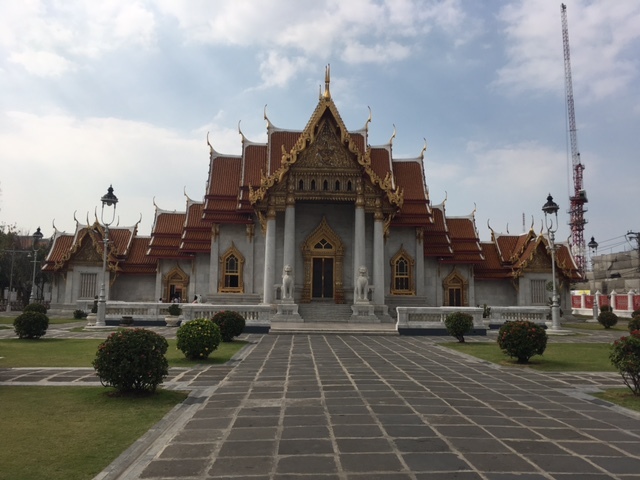 We also visited Wat Benchamabophit, the marble temple. In the court yard surrounding the ubusot are 52 Buddhas showing different positions and historic styles. 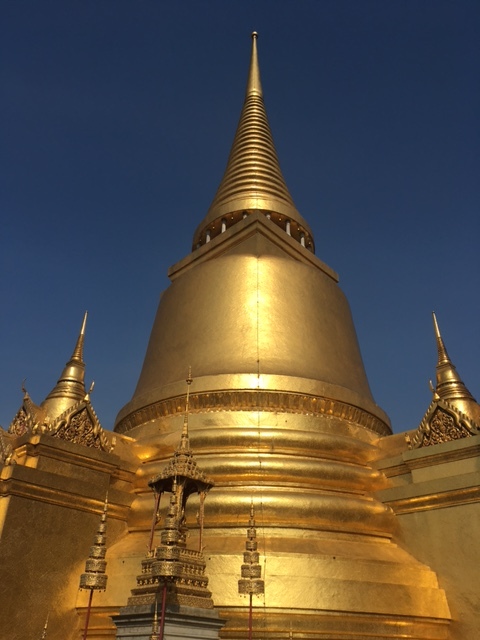 The next day we went to the Golden Mount, the highest point in Bangkok and neighboring temple, Wat Saket. 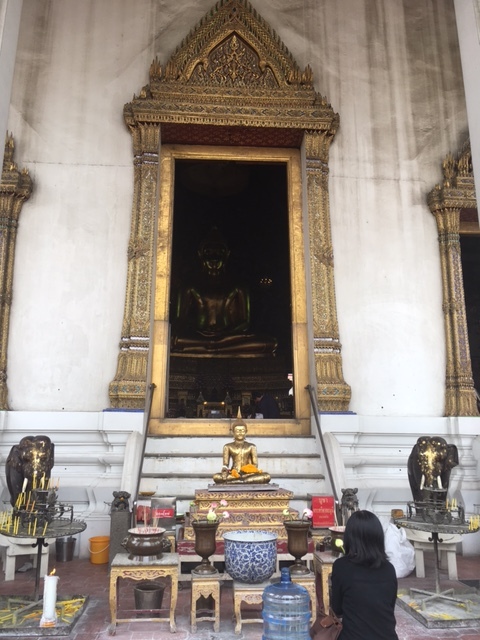 The Golden Mount was made from the dirt dug from the canals and had winding stairs to the top where a stupa is said to hold some of the ashes of the Buddha. A monk chanted blessings over a loud speaker and there were the usual lotus and incense for sale to use as offerings. I rang a series of temple bells as I made my way to the top. 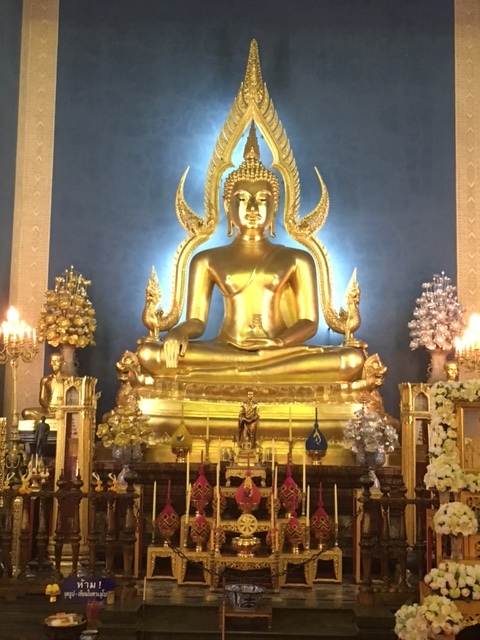 In Wat Saket there is a 30 foot tall golden walking Buddha. Around the edges of the temple were clips holding ribbons of money. I realized that they were for upcoming Chinese New Year so I stapled my 20 Bhat note to the ribbon under the sign of the dragon—my sign—I’m pretty sure this will bring me good luck –-figured it couldn’t hurt. On to my final golden temple, Wat Suthat, we were getting to the less touristy temples so were the only westerners wandering the grounds. Two temples with magnificently painted walls were an oasis in the busy city. The high walls and ceilings were covered with stories and scenes of the Buddha’s life; it was like the Sistine Chapel of Thailand. In the second temple the monks were setting up chairs for a ceremony. 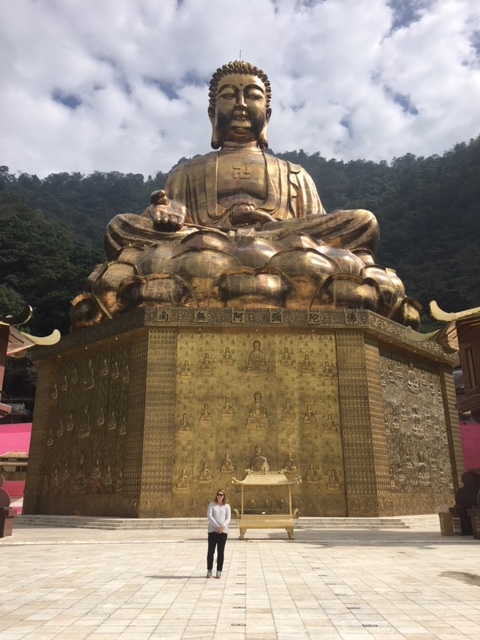 I was sorry to be leaving the next day but so grateful for my journey to the land of the golden Buddha. For my last temple I made a donation for a lotus. I wanted this to me my last act of this sacred journey. I placed the lotus on the alter outside the temple and thanked the Buddha for his serene and holy presence.